Take a look at your fingernails. What do you see? Did you break a nail today? Yesterday? Did you know that before surgery, you must remove all nailcolour so the Operating Team can monitor your health through your nailbeds? It's not as gross as it sounds. They monitor your oxygen intake through the colour (lividity) of your nailbeds. 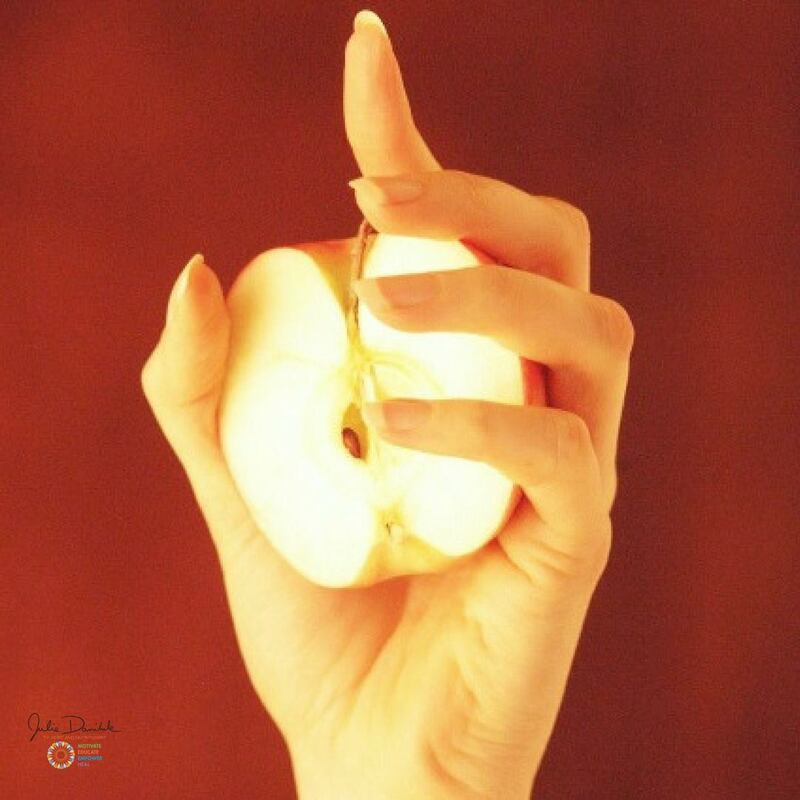 So, there a few different symptoms that you can monitor your fingernails for, and help point your health rediscovery at – especially in regard to your need to increase a variety of vitamins (and minerals), or decrease them. If your nails are thin and break easily, it may have to do with your diet. 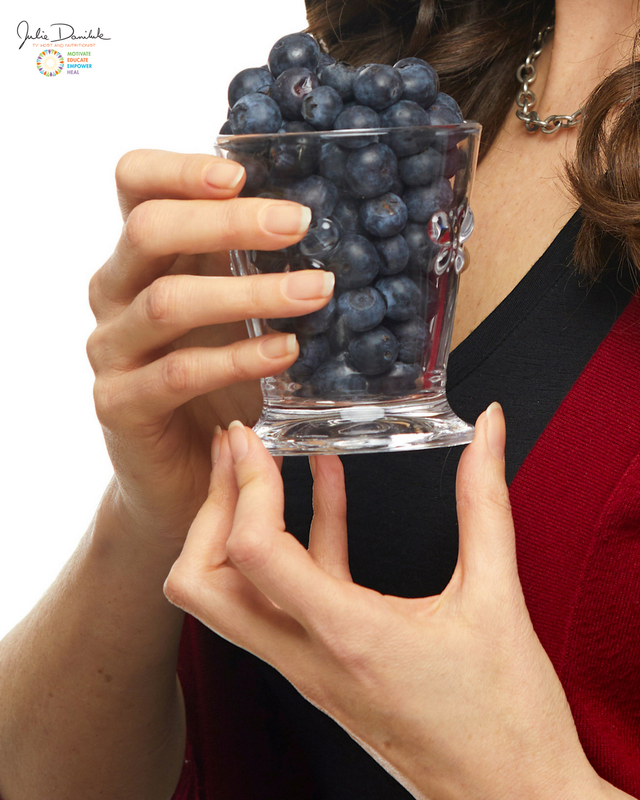 Are you ready to learn what you can eat or drink to get your nails strong and shiny? Here's my Top 10 Symptoms to check! I have very brittle fingernails. A lack of Vitamin A and calcium causes dryness and brittleness. Meals That Heal Solution : Drink carrot juice to strengthen your nails. I suggest Biotta Carrot Juice. Click here for some of my delicious Biotta Recipes. 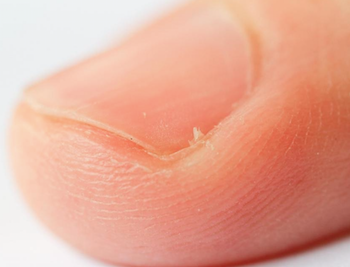 A lack of protein, folic acid and Vitamin C causes hangnails. MTH Solution : Eat a daily diet composed of 3 fruit and 7 vegetable servings in order to supply necessary vitamins, minerals and enzymes. Additionally, consume foods that are rich in silicon and sulphur, such as fish, broccoli and onions, alongside biotin-rich options, such as Swiss chard, nuts, seeds, carrots and eggs (if you tolerate them). My nails break easily and/or have white bands. A protein deficiency can cause white bands and breaking nails. MTHS : Eat enough protein (50g-80g each day) from beans, seeds, fish, poultry and free-range meat. Consider an easy-to-digest protein powder to ensure you get your daily needs covered off. Manitoba Harvest offers a beautiful hypo-allergenic Hemp Protein that is vegan and incredibly easy-to-digest. If you are consuming an adequate amount of protein and still have symptoms, you may be having an issue with digestion. I suggest incorporating a protein digestive enzyme. My fingernails are always splitting. MTHS : Beets contain Betaine Hydrocloride which helps your digestive process. Grate fresh beets into your next salad, or try out this one from my 3rd book, Hot Detox. My fingernails are over-rounded at the ends and/or are discoloured. Vitamin B12 deficiency can overly rounded ends and discolouration of your nails. MTHS : Enjoy seafood or, if you're vegetarian, consider a Vitamin B12 supplement. For more information about an amazing source of Vitamin B12, click here. 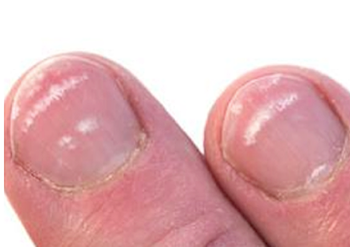 Insufficient zinc can cause white spots to develop on your nails. MTHS : Let's pump-up the zinc. Pump it up with pumpkin seeds, liver or oysters because they are the definition of zinc-rich foods. My fingernails have cuts and/or cracks. Cuts and cracks in your nails may indicate a need for more liquids. MTHS : Charge up your thirst for more water by adding a flavoured herbal tea bag to your water bottle. When your liquid is pleasant to drink, you're more likely to get your full 8 cups. I have red skin around my cuticules. MTHS : Boost up your Omega-3 fats by eating more seeds, like chia or flax, and make sure to eat lots of coldwater fish, like salmon and herring. Including a fish oil, such as Ascenta's Nutra-Sea is a terrific idea – and an excellent product. Ascenta also makes a DHA, GLA and SDA vegetarian product called Nutra-Vege. My nails have vertical ridges. Many vitamin deficiencies could be the cause of vertical ridges, as your body's production of keratin, a type of protein, is interrupted. MTHS : Nutrient deficiencies can be caused, as we age, by low stomach acid. Consider using a digestive aid to increase absorption of repair minerals (i.e. silica, protein, Vitamin B and Vitamin C) which are known to improve healthy nail growth. My fingernails have horizontal ridges. 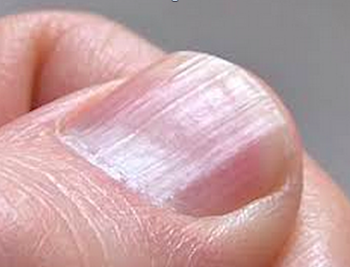 If you lack iron, horizontal ridges can develop across your nails. MTHS : Red meat, fish, seafood and beans are high in iron, as are dried apricots, prunes, raisons, currents, figs, almonds, walnuts, pumpkin seeds, sunflower seeds, beets, seaweed, dark leafy greens and whole gluten-free grains, such as teff, quinoa and amaranth. Take your choice! Anemia is not only a dietary deficiency of iron, it a can also result in not getting enough Folic Acid or Vitamin B12. Vitamin B12 is only available in animal products, so if you are meat-free you will need to supplement (try this!). My toenails have fungal infections (Onychomycosis)! Help! A fungal nail infection is a common condition that begins as a white or yellow spot under the tip of your fingernail or toenail. 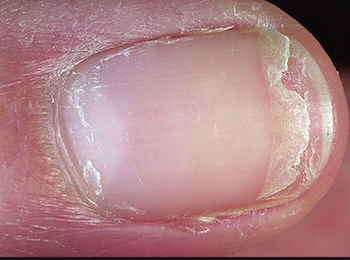 As the fungal infection goes deeper, nail fungus may cause your nail to discolour, thicken and crumble at the edge. A white or yellow debris builds up under the nail in an advanced condition. This infection can be contagious, so it's important to disinfect your shower and bath with a cleaner that contains a natural anti-fungal, such as Tea Tree Oil. MTHS : It's important to treat fungal nail infections from the inside and the outside. A deep, long-term candida cleanse under the guidance of a Naturopathic Doctor or Holistic Medical Doctor is a good place to start. PLEASE NOTE : Always consult your doctor before consuming internal supplements. Kyolic Aged Garlic Extract – Garlic is naturally fortified with selenium, a mineral and nutrient that your body needs to stay healthy. This protects your body from damage caused by free radicals and infection and basically assists in improving nail growth and health. Garlic is most effective in the extract form for to its antifungal and antibacterial properties that are helpful in a nail-growth treatment, too. Nature's Way Olive Leaf – Olive leaf extract offers antioxidants that prevent and repair cell damage, fight candida or fungal infections, and work to keep it away. High Dose Probiotic (Genestra Brands HMF Powder) – Probiotics help keep your gut clean and healthy, thereby cleaning your blood, nourishing and strengthening your fingernails. Omega-3 Fish Oil – Omega-3 acids found in fish oils provide moisture and lubrication for your nails, decreasing the risk of dry and brittle nails. Those same acids reduce inflammation in your nail bed, which leads to nourishment and promotion of healthy cell generation in your nail plate. BioSil – One of my favorite products to dramatically improve nail strength is BioSil™. BioSil® “turns on” the cells in your body that naturally produce keratin. 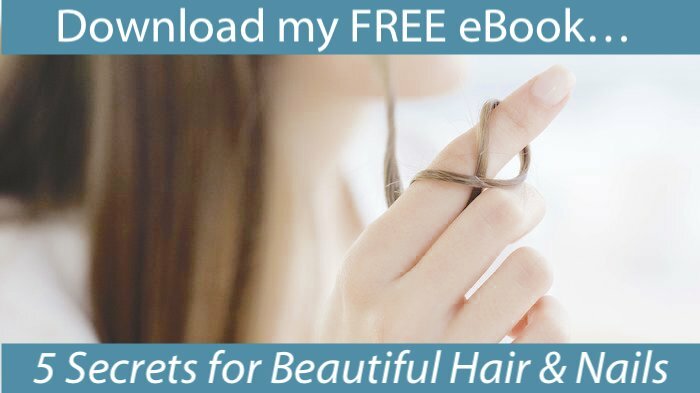 Natural treatments for amazing nails – on your fingers and on your toes! Make sure your feet can breathe! Wear sandals whenever you can. When wearing socks, change them daily. You may need to replace your footwear (shoes and sandals) if they have become embedded with fungus. And don't neglect your bathroom! Disinfect your shower and bath with a cleaner that contains a natural anti-fungal, such as Tea Tree Oil. Make sure your nails are trimmed! To achieve maximum results with any natural remedies and topical treatments for toenail fungus, it is essential that you keep the nails trimmed short and filed every week. Disinfect your scissors between trimming each toe so the fungus doesn’t spread to your other nails when you trim them. Discard your emery boards after each use. Make sure you soak it up daily! Soak your feet with 1/3 cup full-strength Apple Cider Vinegar + 2 cups hot water + 1/3 cup Epsom Salts once (or twice) a day for at least 30 minutes. Make sure your toes get oiled up, too! Apply a coating of Tea Tree Oil to your toes at least once a day after your foot soak. Make sure you read up! Undecylenic Acid is a fatty acid that works by preventing the growth of fungus – you may have heard of it for treating Athlete's Foot or Jock Itch. Search your health store for a natural product which can be applied to infected nails. "Prescription For Nutritional Healing" by Dr. James Balch, M.D. and Phyllis A. Balch, C.N.C.